As a Lockwood Deadbolt Locksmith we are able to install any Lockwood Deadbolt, Repair any Lockwood Deadbolt and modify Lockwood deadbolts. We Specialise in installing deadbolts to doors and gates. In homes, offices, work site ant where that extra security is required. 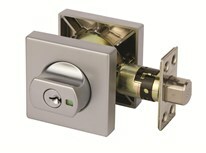 Lockwood Deadbolt 005 Paradigm Slimline style deadbolt that has a multi-mode function. A modern deadbolt that has a price tag against it being a Lockwood branded deadbolt. The deadbolt has a safety release so when the door slams it will prevent you from being locked in. There is a green indicator which tells you if the deadbolt is locked or opened. This Lock can be locked or unlocked with a key. The Lock can be transformed into a passage mode by using a key to pull the bolt in and hold it back. From the inside of the Lock you can turn the knob to lock the Lockwood deadbolt. This can be installed on a door thickness between 32 mm to 48mm thick. The stainless steel bolt that goes into the door frame is made of high security steel and is cut resistant. So anyone trying to cut the bolt in the lock will find it very hard. The front side of the Lock is flat and the back side of the deadbolt has a turn knob. The Lockwood 005 Deadbolt Lock has also been tested for Anti- Corrosion in accordance with AS2332.3.1:2001 neutral salt spray test. The stainless steel version of the Lockwood deadbolt has an increased level of corrosion resistance. Installation of the Lockwood Style Deadbolts. 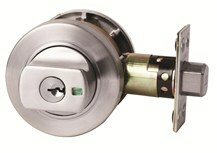 You can buy the Lock or we can supply and install the Deadbolt Lock for you. Match Dead Bolt Lock colours to your existing Locks on your door. 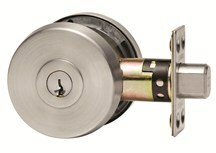 The Lockwood Deadbolt 005 Lock can be master keyed and rekeyed. Remove existing deadbolt or door Lock and install a new Deadbolt. Secure your home with a Deadbolt. We install deadbolts with no holes in the door, metal door dead bolt, wooden door dead bolt, fibreglass door dead bolt, interior door dead bolt, exterior door dead bolt, bedroom door dead bolt and home door dead bolt.